Nintendo’s version of Rock ‘em Sock ‘em Robots, Arms, has struggled to stay relevant since its release back in June. Arms is by no means a bad game, and Nintendo’s been enthusiastically supporting it with post-release updates. But a month in, there isn’t much to grab onto with Arms. Early on, Arms’ prospect as an entry-level fighting game seemed sure. Nintendo touted its competitive potential with demos—though confoundingly, with the game’s motion controls, an unorthodox scheme that seemed to ensure accessibility. The question after launch seemed to be: would Arms be a serious game for fighting game fans, or a Nintendo-style party game, accessible to any child attending their friend’s birthday? At first, I played exclusively in Ranked Mode, where opponents took the game seriously and challenged me with thoughtful strategies. I didn’t touch Party Mode, its chiller, more scatterbrained cousin that let me play Team Fight and Arms’ takes on volleyball, basketball and target practice. These seem to be Arms’ two types of players, and the game caters to neither. Arms’ higher tiers are plagued by cheesy playstyles and quitters, and its “fun” modes aren’t that fun. At best, the party modes are palate cleansers between 1 vs. 1 matches. Arms sold 1.18 million copies in two weeks. Right now, Arms is the Switch’s 13 best-selling game in its eShop. In part, Arms’ comparatively low install base (Splatoon 2 moved over half that many copies in three days) seems to be a branding issue: Arms doesn’t know who it’s for, and neither do Switch owners. 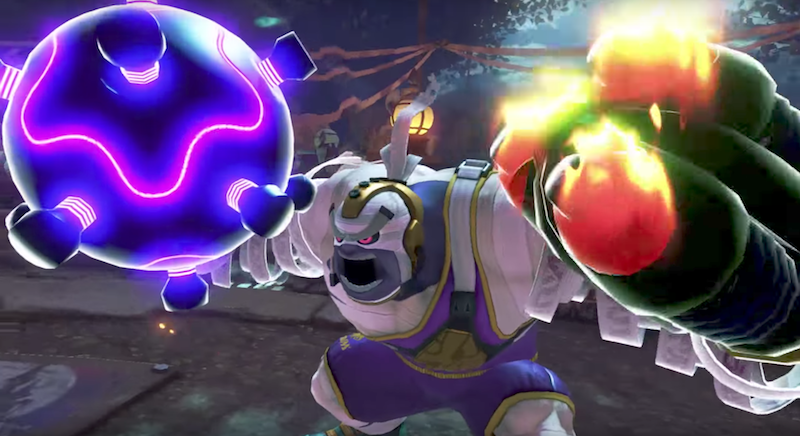 Sure, Nintendo’s latest patch for the game gave “Ranked” players what they wanted: the free DLC fighter Max Brass (and new three sets of arms), a great, simple new stage for clean fights, a level cap increase for ranked mode and penalties for players who disconnect (The next patch’s content and release date are unknown.) It’s clear that Nintendo’s currying faith in their long-term support for the game’s competitive future, but I’m not sure how many players are viewing it as a true fighting game and not an underdeveloped launch title. Twitch is ripe with opportunities for uninitiated players to understand a game’s appeal. Twitch streamers are tastemakers, and their success streaming a game can be a reflection of a game’s hype. Some games, like Battlegrounds, live and die by Twitch. Arms has only one major streamer, and while his streams are entertaining and informative, high-level Arms play can get repetitive after a while. The stages and fighters and arms may change, but in the end, Arms’ fighters’ only moves are punching, blocking, dodging and throwing. Since picking up the game prior to release, the divide between serious and not-so-serious players has become a problem. I don’t enjoy “Ranked” mode anymore, because rage-quitting is a plague. About a third of the matches I’m slated to win are abruptly cut short by someone disconnecting. Cheese playstyles like baiting, camping or throw spamming are the norm. Arms is glitchy. It doesn’t have that many fighters. The Switch’s reliance on Wi-Fi is unsettling (which could account for disconnects). And with just punches, throws and blocking, its mechanics, at least at face, don’t seem that deep. Over time, I’ve migrated over to Arms’ “Party Mode” where I encounter fewer try-hards, but understand less why Arms wasn’t released as a simple mobile game. Arms will make its major fighting game debut at EVO Japan in 2018. Last week, a few dozen top players strutted their stuff at New York’s Defend The North tournament. What will be beyond that? Arms does one thing pretty well—boxing with slinky limbs—but doesn’t knock it out of the park on any other front. If you want to punch cute cartoons with spring arms, it’s your game; and if you want to meticulously earn and curate those arms, you’re in luck. But it’s kind of a one-trick pony. And, after a while, even that one trick fades in novelty, even though it’s pretty damn hard to master. Arms is a curious case study in what happens when what could have been a strong Nintendo mini-game gets blown up into a full-sized title. It’s by no means a lost cause. But what I’m hoping for most: To see Spring Man and Ribbon Girl in the Switch’s nowhere-to-be-seen Super Smash Bros. port.